Fabulous or infernal region beneath the waves in such early Welsh texts as Breuddwyd Rhonabwy [The Dream of Rhonabwy]. Like the Irish cognate Lochlainn [..or 'Lochlann'..], Llychlyn comes also to mean Scandinavia, its definition in contemporary Modern Welsh. So, initially Lochlann/Llychlyn was the name for a region beneath the waves, but later it became the name for Scandinavia. Maybe because the Vikings came from the same direction (let's say, the north-east as seen from Ireland) as where once the original Lochlann/Llychlyn was located? Now, if the Doggerlanders would have wanted to sail to ancient Ireland, then they would have to go north, pass by Scotland, and then go south again to reach Ireland, and so apparently coming from the north or north-east in the eyes of the people inhabiting ancient Ireland. Well, someone else appears to have the same idea, and it's Ulf Erlingsson, the geographer/geologist who had a theory about Ireland being Atlantis (which I don't agree with at all). In his theory, however, he tries to explain that Dogger Island (the present Doggers Bank) was the place of origin for several ancient and mythical arrivals in ancient Ireland, and that it's final sinking into the waves was responsible for the creation of the Atlantis myth as described by Plato. On one of the first pages of this thread I said I would already be happy if they found some megalithic structures on the bottom of the present North Sea, and that I was not awaiting an announcement on CNN that they found a couple of pyramids down there.. The problem with the European megalithic structures is that they started building these things from around 4500 BC and onwards, and that is a couple of thousand years after the last part of Doggerland - the Dogger(s) bank - was flushed down the drain by the tsunami caused by the Storegga Slide off the coast of Noway. But then I remembered that on one of my many Google searches for this topic I found a structure in Denmark - a tumulus? - that dated from 6000 BC, and we now know that that was just a 100 years after Doggerland sank beneath the waves, and could have been built by refugees from Doggerland. That was months ago, and I also remember that when I tried to retrieve that page/image, I failed to find it again. So, a few days ago I made another attempt to find that structure in Denmark, but ended up with a link to site from a guy who tried to prove that both Homer's Iliad and Plato's Atlantis originated/took place in/around the North Sea. Well, I guess many of you know that some have tried to prove that Atlantis was in the Baltic (Vinci) or in Ireland/Doggers Bank (Ulf Erlingsson) or around/on Helgoland (Spanuth) or that the Iliad took place in England/North Sea (Iman Wilkins and several others), and you all know that I tried to stay away from "Atlantis" as much as possible. OK, but with that Google search, I hit upon this site ( http://www.nwepexplo.../megaliths.html ) by a "Guy Gervis", who situated Homer's Iliad and Plato's Atlantis in and around the North Sea; he even has a name for Doggerland: "Lacuna" (which means nothing more or less than 'gap', or 'hole'). Well, he admitted to have been inspired by the ones I mentioned, but he also wrote about a few other people I never heard of, and so I Googled again. One of the people he mentioned was Robert Graves, and he said that this philosopher/poet assumed that the Dogger Bank was the place of Atlantis (the City). Hmmm... I couldn't find anything about Graves and his ideas about Atlantis being situated in the North Sea ( I do have his "The White Goddess", but I didn't check it for any mentioning of the Atlantis myth. I will, believe me...). Then there's this another name that Gervis talked about, Jean Deruelle, and his book "De la préhistoire à l'Atlantide des megaliths'. http://artslivres.co...icle.php?ld=535, "13 HIS Atlantide (2009_12_10) trampoline". I call "trampoline" a file that is abundant, opens up new avenues, and proceeds by jumps around a main topic. 1. I put on the site the full BT2 (file of?) Atlantis. - # 62 Back on the "districts"
- # 64 Ulysses, an unexpected witness. 2. Solon: his inquiry, projects (# 44). Pierre Vidal-Naquet, historian, or Luc Brisson, translator of Plato, have refused to engage on the ground moving to the genesis of Atlantis. It is generally said that "while Plato invented. "I prefer to say, Plato did not invent anything but transformed". I left the idea that Solon had actually collected information from the Peoples of the North calls for convenience Atlantis. Solon, the great Athenian legislation was also a big seller (he was exporting olives) and a great traveler (he knew the Mediterranean). Curious about everything he had, I think, included information about traders who sold amber from the north. He would have amassed an impressive documentation. In his old age, according to testimonies, he was happy to present the point they said he rambled. I think Plato has received this documentation, it was pruned to reconstruct and make the text we know. I have retained as valid the assumptions made by Jean Deruelle (1915 - 2001), Ecole Polytechnique and a former director of Coal Mines of Lorraine. His fundamental work is "Atlantis megaliths" (1999 ed. France-Empire). There was little response despite the strength of its assumptions.We read with interest an interview summarizing his work in http://artslivres.co...icle.php?Id=535 (ME: ..which appears to be gone). The megalithic civilization lasts - 5.000 to - 2.500. Peaceful and very organized, they built these huge monuments we know that some infrastructure. Archaeological traces of a social organization districts for their dimensions coincide with the "districts" described by Plato. 4. The Nordics driven by the cold. I summarized the data provided by Deruelle. Towards -9000 starts communal life in Palestine (Jericho), then -6500 the extraordinary urban civilization in Asia Minor (Catal-Hoyuk). But around - 5000 they have disappeared. Subsequently, in high contrast, the European model is still present in the east and west. To the east, since the invention of the metallurgy of copper to -5000, Danube Valley is devastated for 3,000 years by successive migrations and violence: Nordics (-4,600), the Battle Axe Peoples (??) (-3,600), "Indo-Europeans "(-2,600), the Sea Peoples(-1,300). A peaceful Western megalithic civilization develops, from -5000, the North Sea, Malta and well beyond via the Atlantic coast. It would have gradually disappeared after -2500. In -2300, driven by cold, the Nordics go down south. From -2200 till - 1800 a hot restore prosperity to Central Europe. What remained of the empire of the megaliths is won by violence but maintains its mastery of the seas in the Mediterranean. From -1.800 to -1.500 a terrible cold spell forces the Nordics to go south again. The last attack had been coordinated by the survivors of the megalithic empire, the "Sea Peoples". The end of "Timeus" by Plato (25b) describes a massive offensive on the entire Middle East. It's almost word for word a copy of the inscriptions of the temple of Medinet Habu about the "Sea Peoples", which, towards -1.200, ravaged Greece,the Hittite Empire and tried to take over Egypt by both Libya and the Gaza Strip. The Egyptian Ramesses III stopped them with much difficulty. The accounts of his prisoners would be transmitted, eight hundred years later, to Solon by Egyptian priests. The Vikings (eighth - twelfth century), distant descendants of the Peoples of the Sea, will also have both sailors, merchants and warriors. 5. A brilliant civilization threatened by water. Many convergences can assimilate the Orichalcum (# 63) amber, product abundant and renowned for its beauty. It was in great demand and its export contributed greatwealth to the peoples of the Baltic. The climate, while almost tropical, also allowed a prosperous agriculture. At one time it was almost tropical. Ulysses (# 64) is shipwrecked on a realm protected by dikes. It must defend itself against the tides (which do not exist in the Mediterranean). Ulysses discovers a brilliant civilization. Homer said it disappeared after a cataclysm that destroyed its banks. All this indicated a kingdom in the North Sea. It could have been the focal point of the confederation of the Ten Western Kingdoms described by Plato. This confederation would have broken up after -2500. The sophisticated dikes of the Netherlands would be the worthy successor of structures described by Plato and Homer. Concerns about global warming climate and rising sea levels in northern Europe cause the same fear of disasters. 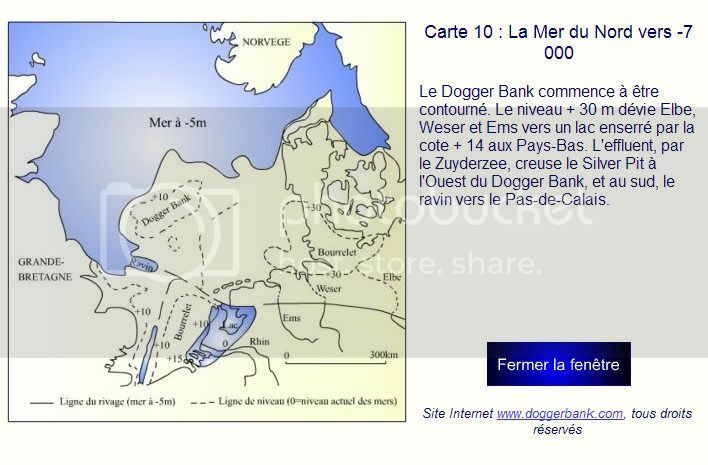 Jean Deruelle thinks, for many reasons, that the Dogger Bank in the North Sea was the strategic center of a confederation. This coincides with the words of Solon - Plato. 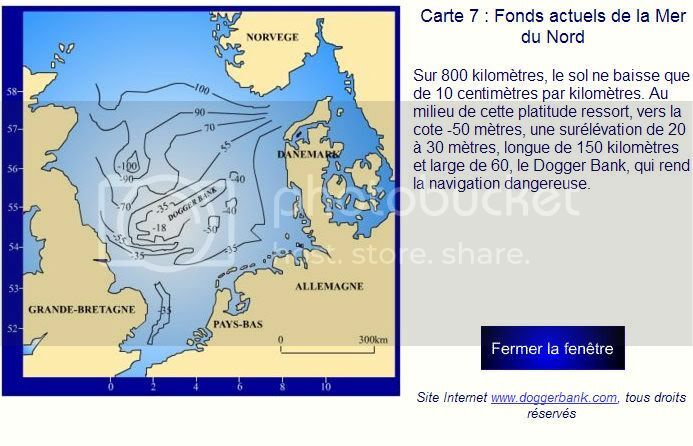 The Dogger Bank is situated 350 km from the Netherlands, is a submarine plateau of 300 x 100 km on the floor of the North Sea, and very dangerous in case of storm. Installed on the Dogger Bank, whereas low emerge, the kingdom has built its dams. After -7000 and this for 4,000 years. In -3000 the situation of the dikes seem to correspond broadly with what is said by Plato and Homer. The Great Plains of the kingdom was located 10 or 20 feet below the level of the sea where huge dikes protected it in a continual struggle. Towards -2600 climatic conditions cause a dramatic breaking of the dikes of the Great Plain. It´s inhabitants must flee. Only the capital remains above water. Towards -1800 the capital disappears, a victim of a last rise in sea level. Survivors join the Nordics and get organized to try to colonize the Mediterranean. Egyptians capture them. That would be the general pattern of this adventure. A Project Group had considered surveys on the Dogger Bank. It sought for several years for a support committee that would guide and fund the fieldwork. All information is visible on the specified site. But nothing has advanced in this project which could start a great period in European archeology. Sorry, I posted the wrong link to the French PDF file about Jean Deruelle. Similar events seem to stretch throughout Europe and into the region of the North Sea. Over 400 pile (lake) dwellings in Europe were overwhelmed so quickly that bronze weapons, jewelry, cooking pots, and other objects of daily use were found in the lake bed. The scene seems to suggest that sudden and simultaneous flood waves occurred in the lakes, and were of the kind that only occur after the most violent earthquakes.
." As a result, a village now rests five meters (16.5 feet) below the surface of Lake Bolsena. Italian Department of Antiquities authorities say that it was smashed by a severe earthquake that caused a violent "tidal" wave to wash over the village, leaving only the walls of the huts. Its full extent is suggested by the Umbrians' history, who are not native to Italy, but legend says that they were driven from their homeland by a terrible flood. These are but a few examples of civilizations dissolved away as a result of floods and gargantuan earthquakes, which seem to dominate the scene of this time period. The island of Cyprus in the Mediterranean has its own story to tell, which has been revealed by the layers of its archeological remains. Citium, an inner harbor, was struck by an earthquake that led to the silting up of the river. Salamis, now a forest of Mimosas and Eucalyptus, was moved to the north after its harbor became silted up due to a disaster that struck its neighbor, Enkomi. An earthquake evidently hit Enkomi, though some attribute its waste to the Sea People. The north of Europe was densely populated before this period of upheaval began. However, it lost most of its population in the 13th Century BC. The archeological evidence indicates an almost total lack of finds on the Danish islands and the Scandinavian mainland. Furthermore, this situation lasts for 350 years, and was the result of widespread forces unleashed against civilization. Archeologists and historians see the events culminating in a mass migration away from the region. Geologists' observations in a number of areas indicate that a huge wave overcame Europe. The West Coast of Germany was flooded by such an enormous wave that banks of silt were created that today stretch 25 kilometers (15.5 miles) and up to 10 meters high (35 feet), even after more than 3,000 years of weathering. On the south coast of the North Sea another excavation disclosed what remained of a "catastrophe of annihilating force": "With all its violent power, the North Sea [struck so hard] that trees were laid flat by the first rush of the water. The tops of these uprooted trees always point to the east, which supports the assumption that the catastrophe was caused by a storm from the west." Also about 2.5 meters (8.2 feet) below the waves near the island of Memmert, ancient dryland was discovered. There, underwater, and in addition to other things, "the hoof marks of cattle and horses were also visible and wagon tracks [were] clearly marked in the soil." Certainly, these had been covered quickly or they would not have lasted, which suggests more than merely "a storm." This event was one of the factors that sent masses of people (including the Sea People) migrating, or more accurately, fleeing for their lives. The story throughout the remainder of Europe is all too familiar when compared with the evidence from elsewhere. In Hungary the existing population either completely died out or moved to some unknown location(s), leaving the area behind for the fundamental, even ethnic changes that occurred with the newcomers, the Urnfield culture. Etna, a volcano in Northeastern Sicily, erupted three times during this period. Thapsos, a promontory, once an island near Syracuse in Sicily, has virtually nothing left of the village that was brought to ruin there. In Central Europe the Tumulus culture, too, filled the pages of its final chapter. The last remains of Stonehenge, enfeebled by the previous cycle, was no match for what this cycle brought upon them, as they passed from history. Spain, France, Portugal and a number of islands were not immune, as elsewhere, to the necessity of wildlife's reestablishment. And it appears to me that this is some other 'flood', not the one that destroyed Doggerland in 6100 BC. It must have happened much more recently, like around 1300 BC. Was that the true "Cymbrian Flood"? 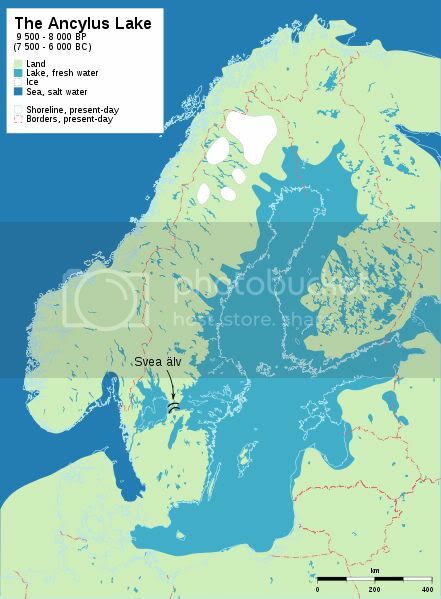 For it is said that there was a Cymbrian flood, but it happened around 3-400 BC (Denmark). Btw, I am trying to look into this just because what happened at this time is of importance for the theory of of Jean Deruelle, but it's interesting in itself, and may deserve it's own thread. I am afraid that many brits never got over losing the Empire. The Age of Empire and all it represents still has alot of resonence with many Brits to this day. We owned almost everything and so many people tend to think we have the right of owenership over places. They may be descendants of the refugees from Doggerland, but there were Doggerlanders who must have fled to Norway, Holland and Denmark too. Well, let's wait untill the next ice age, and see who will claim the then above sea level bottom of the present North Sea, LOL. I checked Robert Graves "The White Goddess", but I couldn't find anything in his book about Doggers Bank, or Atlantis being situated in the North Sea. Tethra, "The White Goddess", Robert Graves, 1981 edition, paperback edition, Faber and Faber Limited, London. "Lochlann was the mythical undersea home of the later Fomorian invaders of Ireland, against whom the Tuatha de Danaan fought a bloody war. The god Tethra ruled it." "Tethra was the king of the Undersea-land from which the People of the Sea were supposed to have originated. He is perhaps a masculinization of Tethys, the Pelasgian Sea-goddess, also known as Thetis, whom, Doge-like, Peleus the Achaean married at Iolcus in Thessaly. The Sidhe are now popularly regarded as fairies: but in early Irish poetry they appear as a real people - a highly cultured and dwindling nation of warriors and poets living in the raths, or around stocked forts, of which New Grange on the Boyne is the most celibrated. All had blue eyes, pale face and long curly yellow hair. The men carried white shields, and were organized in military companies of fifty. They were ruled over by two virgin-born kings and were sexually promiscuous but 'without blame or shame'. They were, in fact, Picts (tattoed men)......(...)"
And from some other passages in his book I gather that Tethra was also associated with cattle. Sidhe is very much like the Indian Sidhu. Fomorians could well be Gomorians. De Vere makes a connection between pharoahs and faeries but I'm not sure about that one, though you never know. They were all tomb kings. What about Fir Bolg? Men with bags I read. Remember the Gobeleki Tepe little baskets/bags. Any connection? Jim, you can't just say one is the other because their names are written similar; btw, the Irish Sidhe is pronounced like 'shee'. In English 'lul' means something like 'to calm down' or 'relax' or something. In Dutch 'lul' means that appendix between your legs if you are a man. And I remember Lulu was Sumerian for 'people'. In short, the Lulu/Lull are an ancient tribe of lazy d***heads, hahahaha!! And I will bet a De Vere will agree with that, heh. I like that, no wonder the ziggurats were never finished (I know they were). In comparing and contrasting hindus with celts/druids we get bit of a problem because both cultures believed in cremation, the druids would just bury the dead for ten years before cremating the ahses. Either way there is little archeological evidence so next best thing could be language. Yeah, it was pronounced shee but De Vere does explain that I am sure. Will need to reread it and can't be a***d.
Finland is a possibility of course. Around 10,500 BP (8500 BC) people from Doggerland (here, from eastern Denmark) could have relatively easily sailed far to the east, following the melt water lakes at the borders of the ice sheet covering Scandinavia and Nova Zembla. It's a way to explain why the Maglemosian culture was spread out over an area from Britain to northern Russia. Finland may have been even more swampy and covered with lakes then it is now, and it was still much lower with a lot of risk of flooding. Like I said, Finland is a possibility of course, but if I would flee my drowning country, I wouldn't go that far to the east: I'd go the the hunting grounds nearby, areas that I would have been very familiar with, like east Britain, Scotland, n/w Germany, Holland, Belgium, Denmark and Norway. http://www.leslignesdor.com/ and click on the button on the left for English. He uses the theory from the other Frenchman, Deruelle, and combines it with the theory of a Alan Butler about ancient math, astronomy and a grid based on 366 degrees ("Salt Lines' or 'Gold Lines', our longitudes and latitudes). I have read the whole site, and.... to make his theory fit, he says he's convinced (like Deruelle) that Dogger Island/Bank stayed above sea level a lot longer (according to Deruelle with the use of dykes), that the megalithic structures are older than they are dated now, and thus one preceeded the other close in time, or better, that the megalithic culture spread from Doggerland onwards....oh, and (EDIT)... may have influenced ancient cultures in Greece, Egypt, Sumeria and India. Somewhere in the first pages of this thread I said it is not very likely that megalithic structures will be found on the bottom of the North Sea, because the last part of Doggerland submerged a few thousand years before the start of the megalithic culture in (western) Europe. But I wish I had thought of this before... let Doggerland live a few thousand years longer by adding protective dykes no one has ever seen on the bottom of the North Sea, and/or make the megalithic structures older by saying that their C14 dating is off (yes, C14, even though it's stone; archeologists use organic material found right under those stones). Nevertheless, another interesting theory about Atlantis (if you forget he had to stretch a few facts...). OK, I will admit: I had a faint hope that this Sylvain Tristan was on to something, even if it wasn't the Atlantis he claimed to have located. But by Googling a bit further I learned he is one of the co-writers of one of Graham Hancocks book's... and then I found this site: http://www.threesixsix.co.uk/........ jeesh. 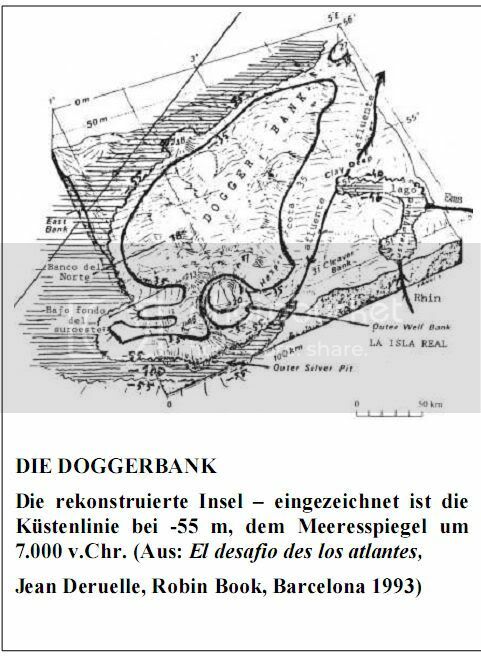 My idea: let's wait till some team of archeologists/divers searches the Dogger Bank (the supposed location of the 'capital' of Deruelle/Tristan's 'Atlantis'.). I think it will be a big disappointment for these guys, but no doubt they will start a new conspiracy theory. and so on. I', not going to copy the whole post here, just scroll up to read it. island in the Atlantic is known to have disappeared: the plateau now called the Dogger Bank. immigrants from Libya, usually known as the passage-grave builders. Just to show you how 'Atlantic-addicts turn and twist the words of others to make their claim of finding Atlantis seem real: Graves did NOT say Atlantis was located in the North Sea. Guy Gervis has a name for Doggerland Lacuna - this may seem to come from no where but the 13th Zodiac sign (Ophiuchus)of the serpent holder is sometimes known as Laocoon, the man who was responsible for tricking the Trojans, a bit of a traitor. There is something in that but I won't go that track. Gap or hole, have you seen this constellation? Looks like a big box...I will check out Guy Gervis theory. Yes, I almost dropped from my chair when I saw he actually had a name for Doggerland.. But "Lacuna" is nothing but Latin for 'gap', or 'hole', as Gervis himself explained, and of course just because it symbolizes a gap in our memory and history, and also a sort of gap in what was once the land that stretched from Britain to Denmark. Sounds a lot better than Doggerland, though. It's 4:38 AM here, I'm going to sleep. in the post glacial era. His doubts concerned its remoteness from the Mediterranean world. If Robert Graves has found Doggerland as Atlantis, I think it deserves serious consideration, it all fits into my own new thread theory very nicely. 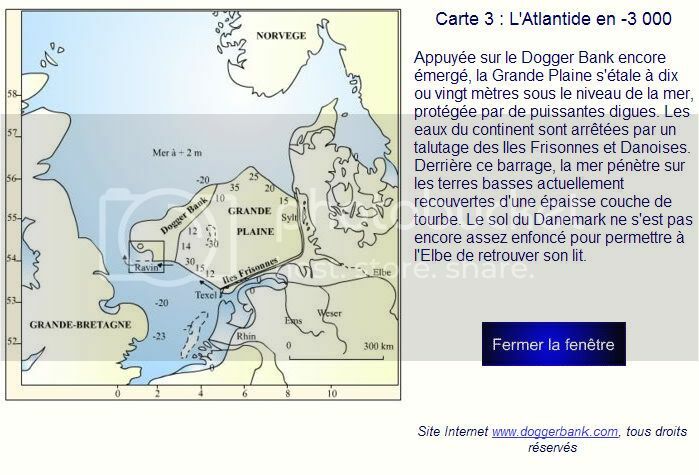 So, Graves didn't say Dogger Bank was the likely site for Atlantis, he said the exact opposite. A century-old case may have been closed - DNA evidence appears to show Europe's first farmers were not related to their hunter-gatherer forebears. Teams from the University of Mainz, Cambridge University and University College London have been comparing the genetic make-up of central and northern European hunter-gatherers with ancient farmers and even today's central Europeans. Their results show that hunter-gatherers share very little of their DNA with the farmers, and just 18 per cent with modern Europeans. Though relatively muted in comparison with other recent finds, the research provides the answer to a question that has mystified thinkers for over a hundred years. Humans traveled to Europe around 45,000 years ago, after which they foraged their way through the last ice age, which ended around 9,700 BC. Agriculture from the Near East then took hold from around 7,000 BC, which increased food potential 100-fold. The group's results appear to prove once and for all that the farmers almost solely flocked from Mesopotamia, and weren't indigenous to Europe. So if we're not related to the Stone Agers, and not the Near East farmers - who are we? However, as much as the team have shaken off one doubt, another even stranger conundrum has appeared in its place. For not only are modern Europeans different from their Stone Age compatriots alone, but neither are they the sole descendents of the Near Eastern farmers who spread across the region either. As population geneticist Mark Thomas puts it, "This is really odd." The researchers have asserted that the Carpathian Basin, which straddles nearly all central European nations, as the genesis for European agriculture. "It seems that farmers of the Linearbandkeramik culture immigrated from what is modern day Hungary around 7,500 years ago into Central Europe, initially without mixing with local hunter gatherers," says Barbara Bramanti, the study's first author. "This is surprising, because there were cultural contacts between the locals and the immigrants, but, it appears, no genetic exchange of women." If you're wondering where Scandinavians got their blonde hair and impressive bone structure from then you can tick hunter-gatherers who inhabited the region at the end of the Ice Age off your list. It seems that an immigrant people from the Eastern Baltic region, who drifted into modern Scandinavia in the Stone Age – around the time of the advent of farming – are the real genetic ancestors of modern Swedes, Danes and Norwegians and even the Saami people of northern Scandinavia, according to new research straddling the boundaries of genetics and archaeology. The study, published recently in the journal Current Biology, is the work of groups from Sweden, Denmark and the UK, and is led by Anders Götherström from the Department of Evolutionary Biology at Uppsala University and Eske Willerslev, of the Centre for GeoGenetics at the University of Copenhagen. It involved examining DNA from Stone Age remains to try and determine whether agricultural process were developed by hunter-gatherer communities – the so-called Pitted-Ware culture – themselves or brought in by new arrivals to the region, who co-existed beside Pitted-Ware people for a millennium until about 2000 BC. The evidence pointed firmly to population replacement by that stage. "The hunter-gatherers who inhabited Scandinavia more than 4,000 years ago had a different gene pool than ours," stated Götherström, speaking to ScienceDaily. Petra Molnar, at the Osteoarchaeological Research Laboratory at Stockholm University, concurred. "Our findings show that today's Scandinavians are not the direct descendants of the hunter-gatherers who lived in the region during the Stone Age. This entails the conclusion that some form of migration to Scandinavia took place, probably at the onset of the agricultural Stone Age. The extent of this migration is as of yet impossible to determine." The process by which humans populated the planet is being constantly revised, and this new finding may cause pre-historians to scribble out an extra line on their human migration map. September 3, 2009 (PhysOrg.com) -- DNA study suggests that further waves of prehistoric immigration are waiting to be discovered. Central and northern Europe's first farmers were immigrants with barely any ancestral ties to the modern population, a study has found. Researchers used DNA taken from the remains of farmers who worked the land more than 7,000 years ago to discover that they were not related to the hunter-gatherers who inhabited Europe previously. Instead, they probably belonged to an immigrant population, possibly from south-eastern Europe. The study also found that the ancient hunter-gatherers do share their predominant DNA type with some modern Europeans, unlike the agriculturalists who arrived in Europe at a later stage. Neither group, however, explains the genetic make-up of much of Europe's current population, which indicates that there were other waves of prehistoric migration that still remain uncharted. The findings are being published in the journal Science and will be released on Thursday (September 3rd) online through Science Express. They appear to resolve an enduring debate about how farming, one of the great "civilising" revolutions in human history, spread in Europe. Generations of scholars have puzzled over whether the change in lifestyle from hunter-gatherer to farmer was brought to Europe by new people, or whether only the idea of farming spread. The new report provides persuasive evidence that it arrived in central Europe with a wave of immigrants approximately 7,500 years ago. The study was led by academics from the University of Cambridge, Mainz University in Germany and University College London. Researchers compared new mitochondrial DNA (mtDNA) sequences from late European hunter-gatherers (up to 13,000 years old) with sequences from early farmers (7,500 years old), as well as with sequences from modern Europeans. They found significant genetic differences between all three groups which cannot be explained by population continuity. Most (82%) of the hunter-gatherers share a genetic lineage known as "U", which is still found today in a minority of Europeans - about 5% of Mediterranean people, increasing northwards to 20-40% of traditional tribes in north-eastern Russia and Finland, such as the Saami. The major DNA type among the farmers, however, was type N1a, which is exceptionally rare, found in less than 0.2% of the European population. The fact that this lineage was not shared with the hunter-gatherers means that the farmers were immigrants who, at least initially, did not mix with the existing population of Europe at the time. "It is exciting to confirm that many Europeans today, especially in the north and north-east, carry ice-age hunter lineages," Dr Peter Forster, of the Cambridge Society for the Application of Research, Churchill College, University of Cambridge, said. "A new puzzle emerges, however. Neither the hunter-gatherers nor the early farmer DNA can account for all European genetic variants today. It seems we need to look for more major, unidentified migrations into, or within, prehistoric Europe. These additional waves might have consisted of secondary farming movements or of later metalworkers." Humans first arrived in Europe 45,000 years ago, replacing a Neanderthal population. A series of major climactic changes then ensued, including the last Ice Age. Hunter-gathering helped humans to survive through that period and was still in evidence 11,000 years ago, as the Ice Age ended. Within a few thousand years, however, it had largely disappeared, as the new wave of immigrants settled and domesticated plants and animals. The study suggests that these farmers settled first in the Carpathian Basin. "It seems that farmers immigrated into Central Europe about 7,500 years ago, initially without mixing with local hunter-gatherers," Dr Barbara Bramanti, from Mainz University, said. "This is surprising, because there were cultural contacts between the locals and the immigrants, but, it appears, no genetic exchange." Farming itself is believed to have begun in the Fertile Crescent of the Near East, between 12,000 and 7,000 years ago. Early communities there began to produce the so-called "founder crops", such as wheat and barley. More recently, it has become clear that early Chinese communities domesticated their own grains, such as rice and millet, independently of western influence and a growing body of research suggests that these methods may also have spread to the West. "We are still searching for the remaining components of modern European ancestry," Professor Joachim Burger, from Mainz University, said. "Hunter-gatherer and early farmers alone are not enough. But new ancient DNA data from later periods in European prehistory may shed light on this in the future." Most men in Europe can trace a line of descent to early farmers who migrated from the Near East, a study says. The research, which looked at the most common genetic lineage in European males, appears in Plos Biology. However, other scientists subscribe to a different interpretation - that this common lineage arrived in Europe during or before the last Ice Age. The invention of farming was one of the most important cultural changes in the history of modern humans. There has been much debate about whether the westerly spread of agriculture from the Near East involved the large-scale migration of farmers into Europe or whether it occurred through the take-up of ideas and new technology by indigenous hunter-gatherers. If the latter was the more important process, one would expect the large part of European male and female lineages to trace back to Palaeolithic times (between 40,000 and 10,000 years ago). Leicester University scientists Patricia Balaresque (who is now based with the French National Centre for Scientific Research in France), Mark Jobling, Turi King and their colleagues examined the genetic diversity of the Y chromosome - a package of DNA which is passed down more or less unchanged from father to son. Y chromosomes can be classified into different lineages (haplogroups) which, to some extent, reflect a person's geographical ancestry. Dr Jobling, who led the research, said: "We focused on the commonest Y-chromosome lineage in Europe, carried by about 110 million men - it follows a gradient from south-east to north-west, reaching almost 100% frequency in Ireland. "We looked at how the lineage is distributed, how diverse it is in different parts of Europe, and how old it is." The male lineage in question, known as R1b1b2, is most common in western Europe, reaching frequencies of 90% or more in Ireland, Wales and Spain. But while this lineage reaches its highest frequencies on the Atlantic fringe, the researchers found that the genetic diversity within it increases as one moves east - reaching a peak in Anatolia (modern Turkey). Genetic diversity is used as a measure of age; populations or lineages that have been around for a long time tend to accumulate a lot of diversity. This principle can be used to estimate the ages of populations. When the researchers estimated how old the R1b1b2 lineage was in different populations across Europe, the age ranges suggested it had expanded in the Neolithic (between 5,000 and 10,000 years ago). Previous studies suggested an origin in the Palaeolithic (40,000 - 10,000 years ago). And controversies remain over how exactly to estimate the ages of Y chromosome lineages. Studies of mitochondrial DNA (mtDNA), which is inherited maternally, tell a different story. The majority of European mtDNA haplogroups appear to have arrived on the continent during the Palaeolithic. Dr Patricia Balaresque, first author of the study, said: "In total, this means that more than 80% of European Y chromosomes descend from incoming farmers. In contrast, most maternal genetic lineages seem to descend from hunter-gatherers. "To us, this suggests a reproductive advantage for farming males over indigenous hunter-gatherer males during the switch from hunting and gathering, to farming - maybe, back then, it was just sexier to be a farmer." Studies of mtDNA have uncovered the signal of a migration undertaken by hunters from northern Iberia (Spain and Portugal) into northern Europe as the ice caps thawed some 10,000 years ago. However, the latest study found no clear evidence of such a signal in its analysis of Europe's most common male lineage. Dr Balaresque told BBC News: "The variance of reproductive success between males and females is completely different. If you look at a population, even now, most of the females have children, which is absolutely not the case for males. "We estimate that about 40% of males do not leave any descendents. This means that each generation, you are losing the traces of 40% of males in that generation. The turnover for males is much higher than it is for females." While R1b1b2 is most common in western Europe, some other lineages thought to have been brought into Europe by Neolithic farmers tend to be most frequent in the Near East, where the farmers started their journey. Their frequency in populations drops as one moves from the south-east to the north-west of the continent, the route taken by the agriculturalists. But in their Plos Biology paper, the researchers write: "Mutations arising at the front of a wave of expansion have a high probability of surviving and being propagated, and can reach high frequencies far from their source." The researchers from the University of Leicester collaborated with scientists from the Faculty of Medicine in Nantes, France, the Peninsula Medical School in Plymouth, UK, the universities of Ferrara and Pavia in Italy, Newcastle University and the Wellcome Trust Sanger Institute in Hinxton, UK. For not only are modern Europeans different from their Stone Age compatriots alone, but neither are they the sole descendents of the Near Eastern farmers who spread across the region either. Dr Patricia Balaresque, first author of the study, added: "In total, this means that more than 80% of European Y chromosomes descend from incoming farmers. In contrast, most maternal genetic lineages seem to descend from hunter-gatherers. To us, this suggests a reproductive advantage for farming males over indigenous hunter-gatherer males during the switch from hunting and gathering, to farming -- maybe, back then, it was just sexier to be a farmer. OK, myths and archeology may not be as hard a science as genetics is, but at least ancient myths don't change every week, and archeological finds do not change appearance after being discovered. It's of course all about interpretation of the facts, but also - as it appears to me - who, when , and where the research was done. It's a matter of time to be able to use genetics as a source of information of the immigrations that took place in Europe after the end of the last ice age. And I am very curious about what they will find when they analyze the bones found on the bottom of the North Sea. This is pic of the migrations of the Doggerlanders, from one of my earlier posts (link ). 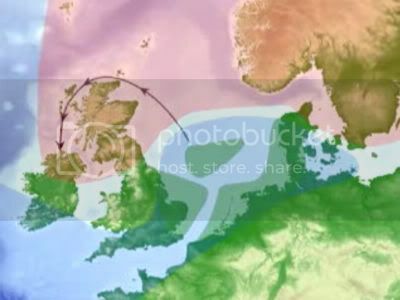 Soooo, based on what geneticists said, there is this possibility that the refugees of Doggerland were the ones responsible for that other prehistoric wave of migration. They were there, maybe, from the end of the last ice age up untill the remnants of Doggerland finally got flushed. And that's a stretch of about 5000 years in time (11,000 BC to 6100 BC, a few thousand years more than I assumed earlier). And don't forget, if we have to believe the conclusions geneticists make, 5000 years should be enough for a change in the genetic make-up of a people living in the best place to live after the last ice age. And why was it the best place to live in? Because it was engulfed by the Gulf Stream, and because it was a low lying country (when the English, Scottish, Germans and Norwegians are freezing their balls off during winter time, we here in Holland are having a mild season in comparison, us living in what's called the "Low Lands"). The surrounding countries, like Norway and Britain were a lot more elevated, and a lot colder, and according to scientists only used for hunting game during the summer months. And then this: the avarage temperature on Doggerland was 2 degrees Celsius higher than in present Britain. In the French region of Brittany, the island of Er Lannic, in the Gulf of Morbihan, contains the ruins of two circles of stones one of which completely submerged by water, the other only half in the surface. The place was at least 5000 years ago the top of a hill, and then, after the construction of the two megalithic complexes, was invaded by the lifting of the sea. Certainly it should not be an isolated case. Recent satellite observations suggest that even in the bottom of the north seas might lie the ruins of other oldest megalithic constructions, built before or during the end of last ice age, before the waters submerged the lands on which stood. Never heard of these satellite observations of the North Sea, but that's the next thing I'm going to do: find these images. I couldn't find anything. And because the majority here wants to blabber about aliens, werewolfs and mystic stuff, it will take a long time to find those satellite pics. But I now think it was nothing but a case of 'wishfull thinking'. That's okay, Abramelin. I have a feeling that that will change for you before long. Stick to the genetics angle and I'm sure you'll learn alot. You do realize, don't you, that none of the articles that followed the above quote has anything to do with anything originating in or from Doggerland? And there is no indication of any kind of genetic mix-up as you mentioned. The farming angle used says it originated in the Fertile Crescent and moved into Central Europe. Again, nothing relevant to the discussion of Doggerland or to the origins of anything from there. I will keep a close eye on whatever they find, believe me. So, as long as the results of that research still stand, my suggestion - and nothing more than that - is that it is possible that that other migration originated from Doggerland. Of course they didn't mention Doggerland, and that's because they didn't analyze the DNA of bones found on the bottom of the North Sea. As soon as they do, we will know more. Untill then, your guess is as good as mine. But my guess is based on archeological finds. And what these people say is that Doggerland was the best place to be in - in northern Europe - after the end of he last ice age, and that they didn't just 'hunt-and-gather', but that they settled there.